There’s an odd-aroma coming from my kitchen pantry. Something is starting to get too ripe or starting to grow. I better find it soon before I have a mushy mess on my hands. I have been avoiding the pantry chaos lately, so this is the nasal incentive that I needed to get cracking on cleaning it. 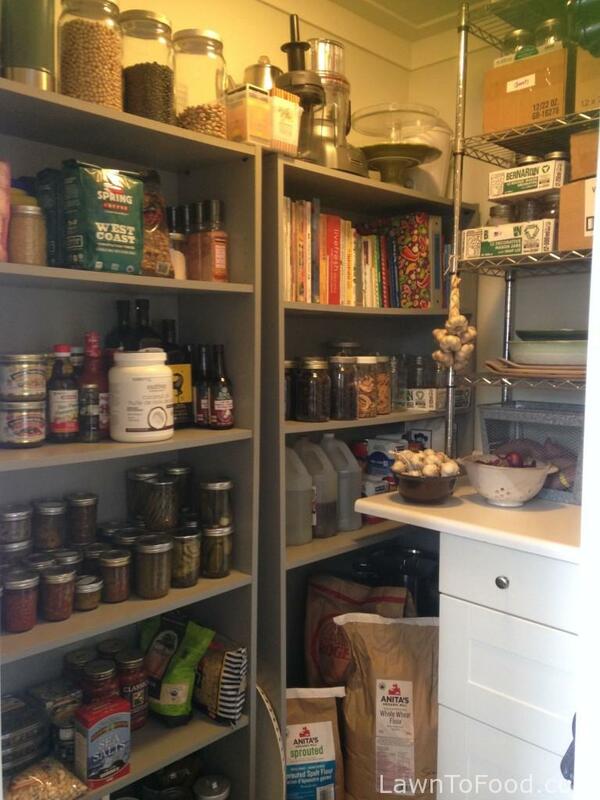 Empty jars are stacked on shelves and lid rings are over flowing in the pantry drawer. Scattered canned goods, boxes of pasta, bags of rice and flour, oils, vinegar and other condiments are not in their usual shelf order. To start, I’ve set out several boxes and flats, that fit perfectly on my wire shelves. The boxes are labelled wide-mouth quart, pint & half, wide-mouth pint and half-pint jam jars. Having my jars sorted makes it easy to select the size I need during canning season. I also have a box labelled for the Comox Valley Food Bank and one for Yard Sale items (because I am a bit of dish-plate-bowl-utensil hoarder). 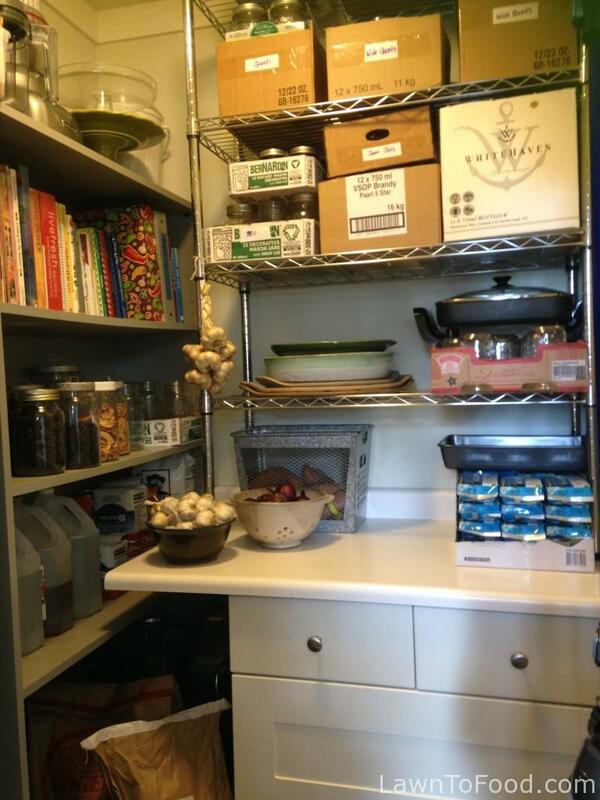 I gave myself a one-hour time limit to accomplish this spring pantry sort. With the clock ticking, I thought I’d be more likely to stay on task rather than get side-tracked on other things … but then … MsM called … and came over with her newly concocted hand cream for me to try! It’s Creamsicle-y Creamy 🙂 Regardless of the break, I was still able to completely complete the pantry sort within 90 minutes. Not only is the pantry now dusted, and organized, but I found the odd-aroma culprit. A sprouting potato that had a mushy eye … eww gross. It has ended up in the fireplace, ready for incineration, and the rest of my recently-discovered sprouting-organic bag of red potatoes, is destined for the garden this afternoon. During my deep clean, I noticed that I am really getting low on canned beans. This is the perfect time of year to soak some dried beans and then process them in my pressure canner. Having canned beans such as kidney, black turtle, borolotti and chick peas ready to go, makes last-minute meals so much easier. I wrote a bit about canning dried beans in my blog post thanksGARDENgiving and have added the new-batch-bean-canning task to my list for next week. Another thing that I noticed, while cleaning the pantry, is that I have a lot of dried white grape raisins to use up. These white grapes were quite tart fresh and after being dried, they were down right sour. Our grandson, Brusselsprout, will not eat them as a snack food. He prefers the dried Seedless Concords that we grew, which are much sweeter and softer to chew, so I’ll need to find another way to use the white raisins in our meals. I had already planned to braise a couple of lamb chops and a few beef short ribs for dinner tonight (I was cleaning out the freeze of odd-sized packages). Now with the white raisins on my mind, I think I’ll take the stewed meat in a Moroccan direction. After browning the thawed meat in my cast iron skillet with salt and pepper, I put the cooked chunks into my casserole crock pot. To soak up all of the flavourful goodness on the bottom of the cast-iron skillet, I added onion, chopped garlic, ginger, leftover frozen-from-our-garden strawberries from Brusselsprout’s morning waffles, cumin, coriander, allspice, a touch of nutmeg, 2 cups of Dave’s red wine, 1/2 quart of MsM’s preserved pears, a cinnamon stick, and … yes, I remembered to add a generous handful of dried white grapes from the pantry. 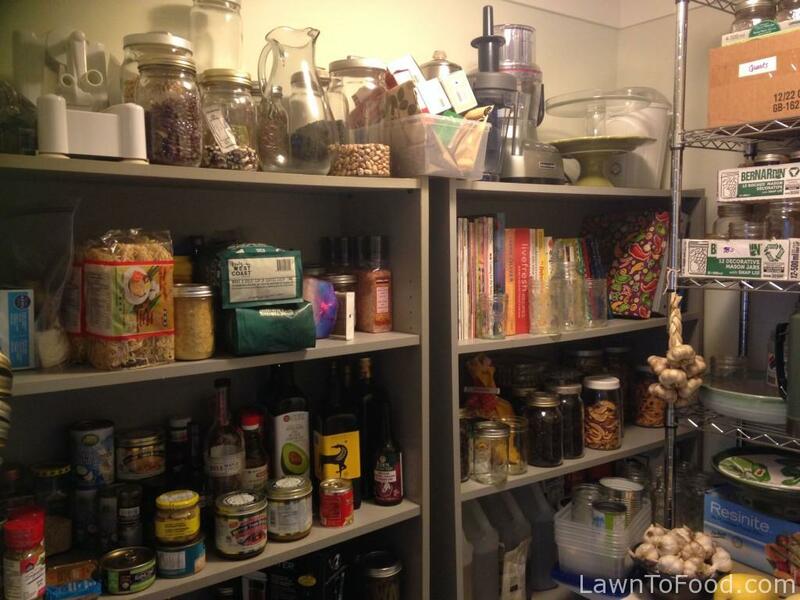 What do you have in the fridge that needs to be used up? 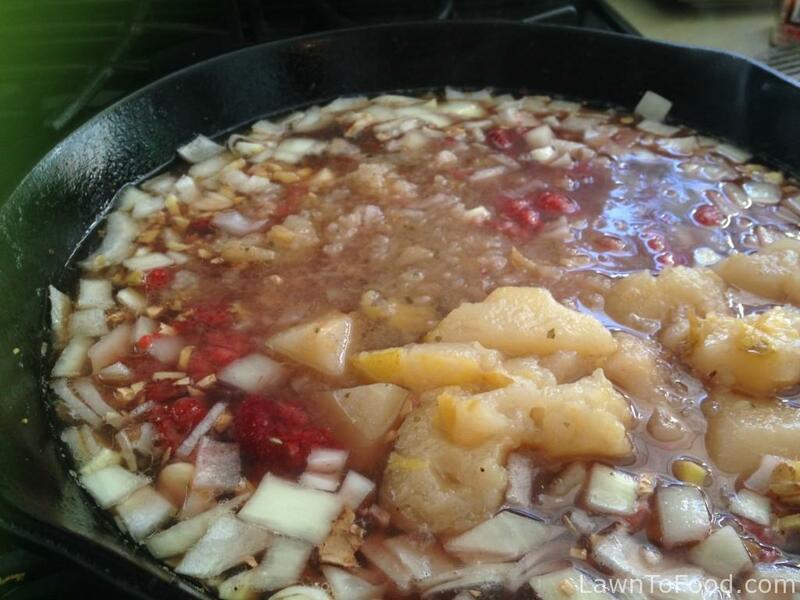 Try adding it to your next sauce! I stirred all of those ingredients together for a short while, and then poured my Moroccan-inspired sauce over the browned meat. 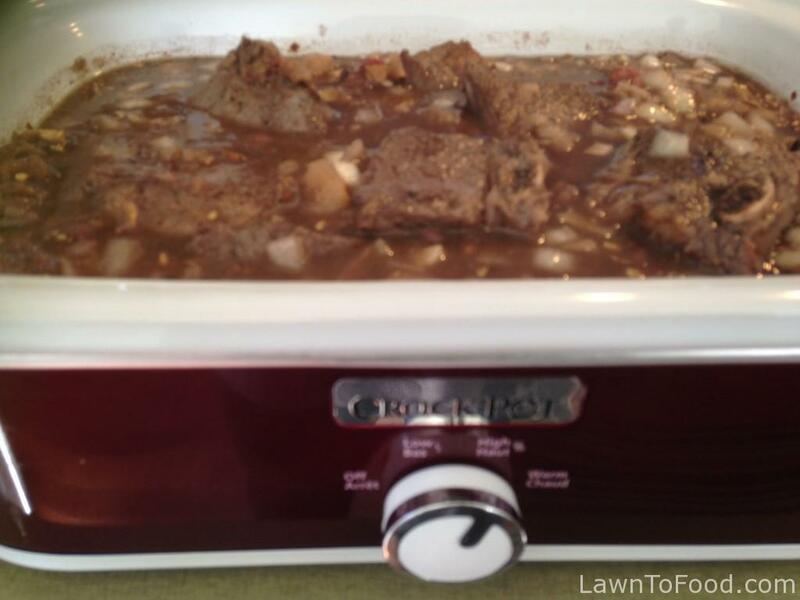 It’s currently on a low simmer setting in the crock pot, promising to be a wonderful supper in 4 or 5 hours. Two big items got check-marks on my list today, pantry completed ✔︎, main meal completed ✔︎ … and now I am heading out to our sunny garden ✔︎ Cheers everyone!